Help! My Early Childhood parents often ask, ‘what can we buy or do with our children to support them at home?’ What should I recommend that they purchase or do in their home environments? Last week, we explored one of the many ways that Paz Montessori offers an emotionally healthy environment. We give children freedom within limits so that children learn to follow their inner guide and feel free to develop at their own pace. We also offer freedom within limits in order to foster self-discipline. Have conversations with your child every day. Include your child in daily activities such as cooking and doing laundry. There are huge developmental, emotional, cognitive and academic benefits to including your child in household activities. For example, your child will feel like an important, contributing and capable member of the family, will feel a connection to you as you do something together, engage in conversation, and work on academic concepts such as classifying the shapes of folded laundry, color and so much more. Provide regular, consistent routines that help your child get the most out of her/his experiences at school including a reasonable bedtime and enough time in the morning to allow for unhurried dressing and eating. Nurture your child’s growing independence in taking care of her/himself and others. Find ways to enable your child to dress and feed her/himself. Teach your child how to do tasks independently. When you want to do something for your child, ask if it is for your benefit or hers/his? Parents sometime baby for their own convenience and sometimes to fulfill the parent’s own emotional need. It is much easier to do for a child than to teach a child. And, as a loving parents, sometimes treat our child as younger than they actually are. We recommend that you make sure that when you baby your child, it is meeting her/his needs, not yours. Limit screen time. Too much can hinder children’s physical fitness and can have a negative effect on social, emotional and academic development. Offer your child a healthy and balanced diet. Limit sugar intake. Dear Ask a Montessorian, soon a student will switch from their public school to grade 5 at our Montessori school. How realistic is it to make the transition academically viable? I’m Early Childhood trained and know that hands on experience with the materials is very important in the early years. Are these materials still required as a foundation in Upper Elementary? What would you recommend that we do to help a new student entering a Montessori class for the first time? Dear Upper EL Guide, when I was teaching in an Upper Elementary classroom, we had many students over the years join our class from other schools, mostly traditional, without any Montessori experience. The transition can be bumpy, but there are things that you can put in place to help the child flourish. In terms of your question about the materials and experiences in the Casa classroom that the child missed, you want to meet the child where they are. This means taking their age into account. I would tend to say that you will not bring in materials from the Casa room for the child to use. You will want to observe and see where the gaps are and present opportunities for the child to gain those skills in a way that matches their developmental level. For instance, you wouldn’t have the child practice a spooning exercise, but you will provide cooking or mealtime experiences for the child to develop the same skills. It is important for the guide to learn about the interests and skills of the child and work to build on those skills to facilitate the building of confidence and comfort in the classroom. In addition, you will want to meet with the parents and get a clear idea of why the child is moving into your classroom at this time. In turn you will provide parents with as much information as you can about how you will approach both social and academic work. Then you will want to assess the child’s academic standing. You will need to plan for many one on one lessons at the beginning of their transition. For example, they may already know how to do long multi-digit multiplication with pencil and paper, but you will want to show them how to do it on the checkerboard and get them comfortable with using the materials. This is where I have seen the most resistance, but over time it becomes easier and they see that all of the other children are using materials for learning and working, too. Planning some community building activities for the whole class at the time of the transition is very helpful in bringing the child into the fold and culture of the classroom. It is helpful to talk about what the class as a whole can do to create a welcoming environment for the new student. Preparing the current children for the addition to the community is a necessary component of this process. I believe that it is important to always be working on building a culture of inclusivity in the classroom. Having grace and courtesy processes in place for welcoming visiting and incoming children and adults is important work that Montessori Guides need to see as a priority in their classroom. These processes take time, thought and effort on everyone’s part. The effort is well worth the positive outcome. Creating this foundation of inclusivity is what will allow the new child to be able to try new things, and be open to getting to know the other children. When a strong culture of kindness, hard work and fun is in place you have a high probability of the new child coming into your classroom transitioning in a positive manner. You have many skills already that will help guide you in these types of transitions. Observing, planning and connecting are the hallmarks of our approach. Just the fact that you asked this question shows that you are a caring and thoughtful Montessorian! Stephanie Pullman has taught at the Toddler, Lower Elementary, and Upper Elementary levels in her career. She has served as a teacher trainer for five years at MWTTP, and currently serves as an adjunct instructor of Child Development at Cerritos College, Cerritos, CA. Stephanie holds a Master’s Degree in Education with a Montessori Emphasis from St. Catherine’s University and received her AMI 6-12 Montessori credential in 1993. Located in Long Beach, California, she enjoys visiting museums, movies, yoga, and reading. In addition to her role as a CGMS Elementary Level Associate Director, Stephanie has served CGMS adult learners as an online instructor, residential session instructor, field consultant, and practicum advisor. 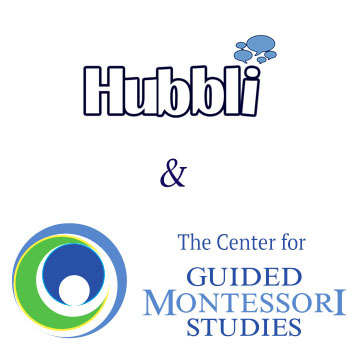 The Center for Guided Montessori Studies (CGMS), Inc, and Hubbli, Inc. are excited to announce a new partnership to develop and promote solutions for schools. The focus will be on ensuring Montessori and other schools can leverage the best technology for reducing their workloads, simplifying their workflows, and strengthening their business operations. CGMS is one of the world’s largest accredited training programs for Montessori certification, and Hubbli, Inc is one of the leading software service providers for schools. The partners agree that Montessori education is at a crossroads and that this partnership can unlock the exponential growth that the community needs. Founded in 2016, Hubbli specializes in solutions that reduce school administrative overhead. Hubbli’s most recent solution, Hands-Free Enrollment Marketing System, simplifies and automates the marketing and enrollment process for schools. It is not uncommon for schools that use the E.M. package to see tour rates increase by 100 to 200%. Hubbli’s initial service, a parent communication platform, has been renowned for saving schools tens of thousands of dollars annually in staff time. CGMS is affiliated with the International Montessori Council (IMC) and was the first hybrid Montessori teacher education program with a significant online component to receive MACTE accreditation. Founded in 2006, CGMS combines the best of traditional Montessori training with the Internet to create an authentic, low-residency program. Today, CGMS is one of the largest accredited Montessori training programs, offering certification for every level from Infant/Toddler through Secondary. CGMS also offers the Early Childhood course in Mandarin and is developing an Administrator certification program, as well as programs in Spanish. Indeed, Hubbli will have non-Montessori clients, and CGMS will happily work with schools that don’t require Hubbli solutions. To solidify this partnership, CGMS is taking a minority stake in Hubbli. CGMS’ director of Operations, Marc Seldin, will be joining Hubbli as the Chief of Product Development. Mr. Seldin will continue in his role at CGMS as well. In the future, the partners intend to develop more integrated solutions that will help schools with managing their finances, student records, and fundraising. This is a great question, and one that is commonly shared. Dealing with history and cultural topics can be challenging, and I’d like to acknowledge you for being considerate of all students to make sure you aren’t alienating anyone. There are a few different ways you can approach this. First, using primary sources allows you to introduce various topics objectively. Pictures, letters, and diary entries to use can be found on the Library of Congress website as well as other collegiate sites. Gettysburg College is a fantastic resource for Civil War primary sources. Because these are first-hand artifacts, you are able to be objective and present the facts. For example, when teaching about the Civil War, it is important to recognize that there were, and still are, two very different views. Requesting that students use primary sources for their research allowed them to learn history first-hand instead of inferring from a secondary source. Second, you can use literature as a way to discover various points of view. When you look at a particular topic from different vantage points, you can elicit discussions to which the students can contribute. One of my favorite ways is to use historical fiction. For example, when we were studying the Revolutionary War in my Upper Elementary classroom, I used Chains, which is told from the point of view of a slave, and Sophia’s War, which is told from the point of view of a white colonist. Once my students read these two books, we discussed the differences in the two girls’ lives and how their upbringing affected their situations. When putting together my cultural plan, I did research online to find historical fiction that would align with the topic we would study. Your local librarian can assist you in finding books as well. Third, you could use the inquiry-based method of learning. This allows for students to make a connection in their own lives and their understanding of a particular topic. It is a way for them to begin to ask questions and conduct research to find answers to those questions. During my student teaching experience, I used this method to study the theme of identity. Once the connection was established, the students were able to ask questions and research topics. It was a powerful example of the wonderings of fifth graders, and it was an amazing lesson for me. Kathy Short, a professor from the University of Arizona, created this Inquiry Cycle. More information can be found in the article she wrote (link: http://www.ibmidatlantic.org/Inquiry_as_stance.pdf). Finally, you can host a parent education night to bring up the topics you plan to discuss. You can let them know that you are aware of the importance of being objective and approach the specific topics with care. They will see the effort you are taking. They may even be able to give you insight about sharing the information. I hope these suggestions help and that you are able to navigate these sensitive topics with care. Maria Burke, M.Ed, the Director of Lighthouse Learning, LLC has a Bachelor’s Degree in Elementary Education, a Bachelor’s Degree in French, and a Master’s Degree in Curriculum Education. Ms. Burke holds credentials through the American Montessori Society for ages 3-12, and completed the course “Building a World Class Montessori School” through the Montessori Foundation. Maria began Lighthouse Learning, LLC in 2007. The Dollar Board™ was the first material she created. Labeling the Cloth, Push Pinning Through the Curriculum and The Quiet Book Manual followed. Ms. Burke has presented and exhibited at a number of conferences across the country, and she continues to create uniquely handcrafted educational materials.